Happy October! 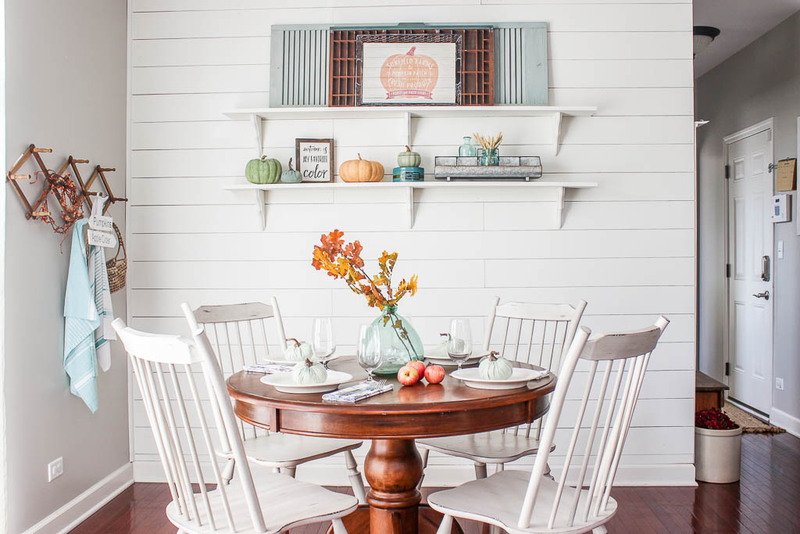 What better way to celebrate the new month than with a handful of Fall house tours?! 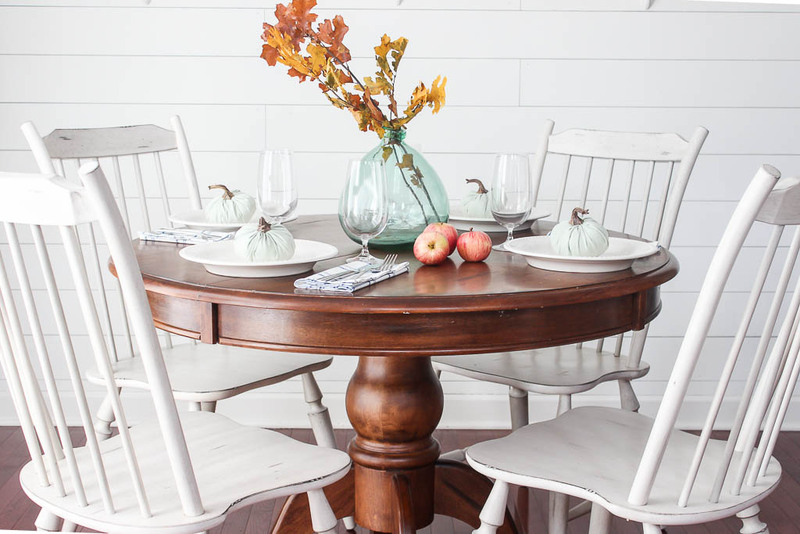 That's right, I'm here today with a lovely group of decor pals as part of our Joyful Fall Home Tours! We've decked out our homes for the season and are looking forward to having you visit. So grab your pumpkin spice latte (or wine! I wont judge, even if it's 7:00 am) and come on in! 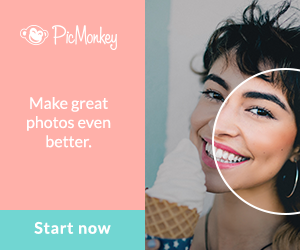 If this is your first time visiting, welcome! My husband and I reside in the western suburbs of Chicago with our incredibly energetic 4 year old, a new baby girl that we just welcomed in June, and a rather lazy dachshund by the name of Brylee. One of my favorite things about our house this season is our new kitchen shelves. Thanks to the progress we've made in this space recently, I was actually really excited to dress it up! 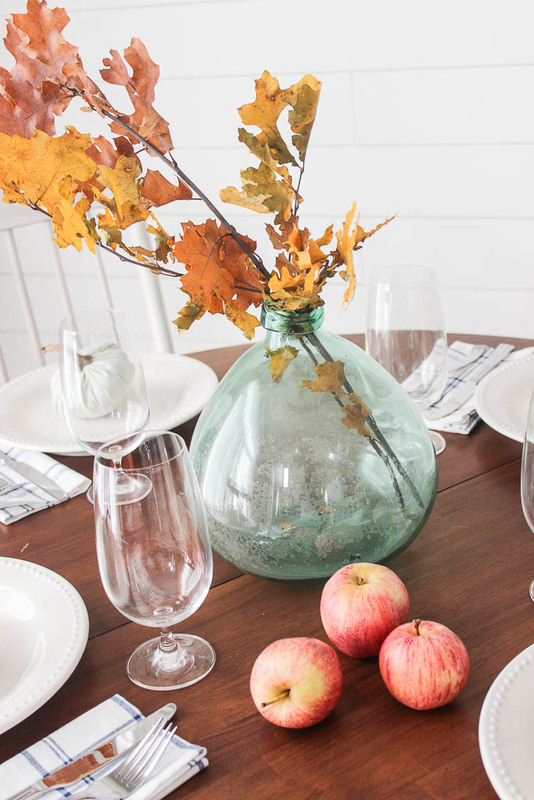 One thing I love about fall decorating is the ability to be able to bring the outside in. 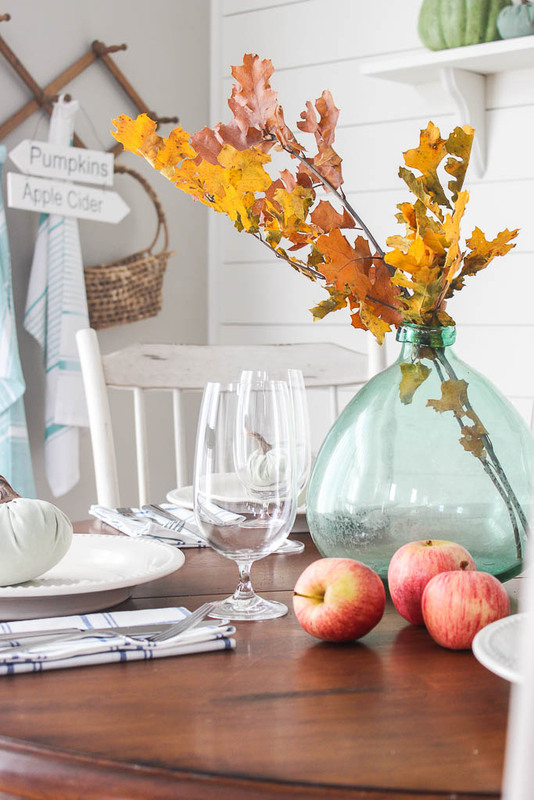 Seasonal staples like leaves, apples, and a variety of colored pumpkins really helped create a crisp fall scene. 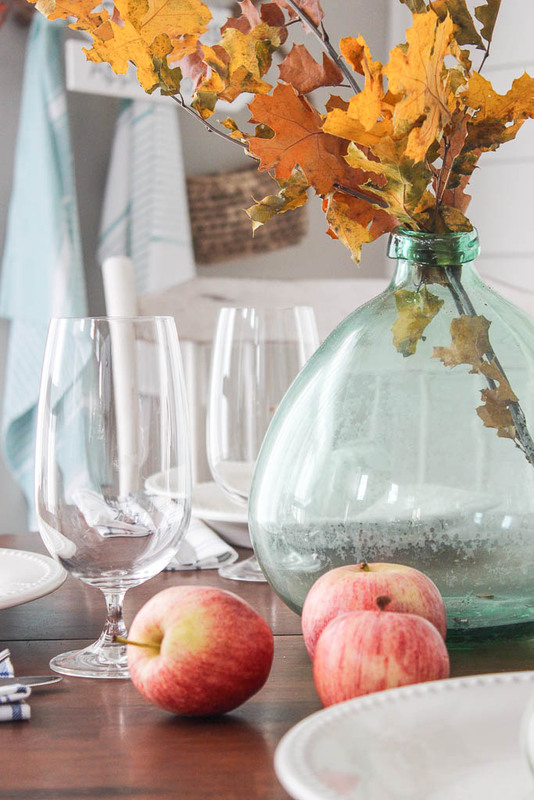 Can we talk about this leaf centerpiece for a moment? Chicago has had an unusually warm start to fall and so most of our trees are just barely starting to turn color. I spotted these branches at Michaels and couldn't believe how realistic they look! 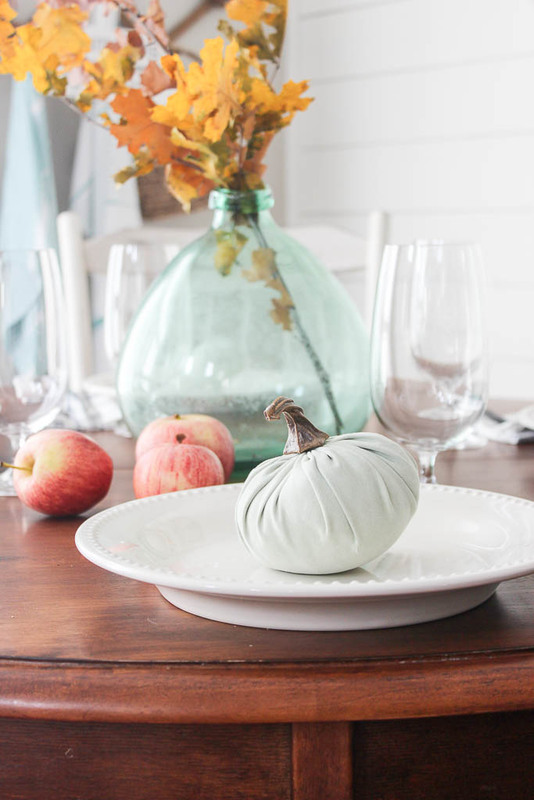 I'm typically not a huge fan of faux leaves but these really helped create the fall vibe I was craving. 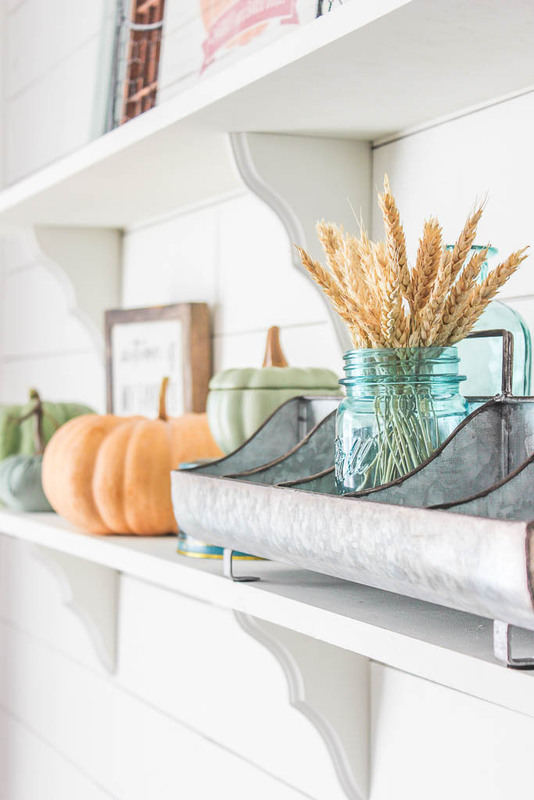 I admit since adding these shelves to our blank shiplap wall, I've come to realize styling shelves is not the easiest thing to do! Maybe it's just me but I find you have to play around with them A LOT until you are satisfied. I kind of like the idea of adding a few unexpected elements to a room, which is how the old shutter on the top shelf came into the picture. 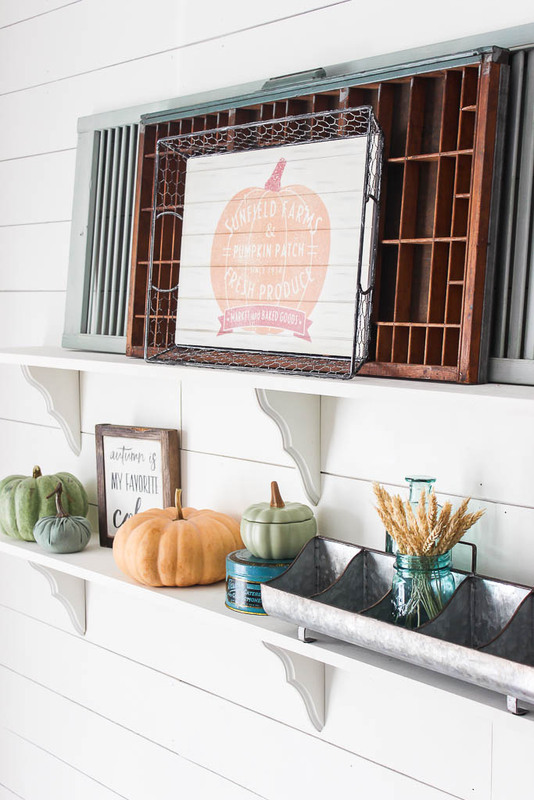 The wood tones from the printer's drawer and the pumpkin patch tray layered in front of the shutter I feel helped warm things up a bit. 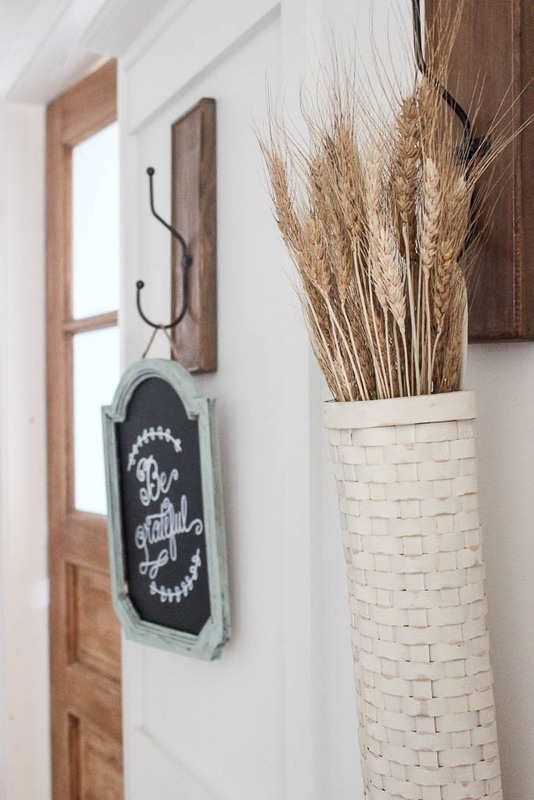 And then of course there's stalks of wheat, one of my favorite things to decorate with in Fall! 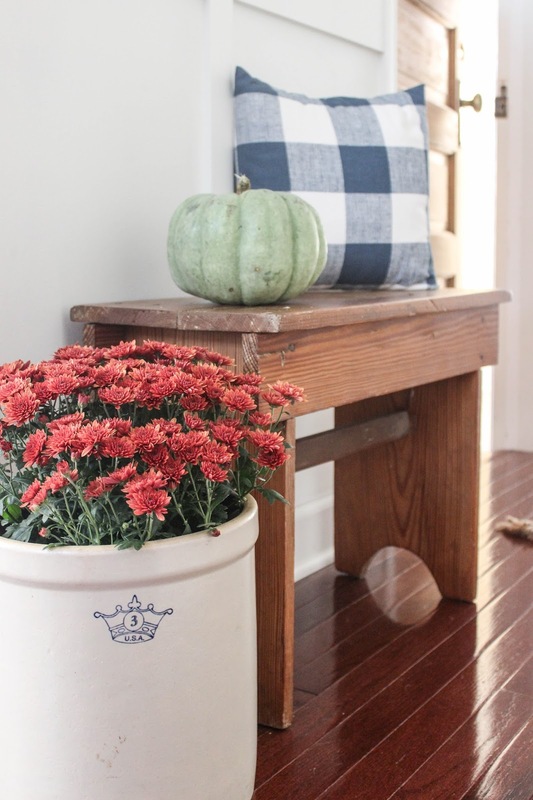 Aside from our kitchen eat-in area, I also added a few touches of Autumn in our back entry way. 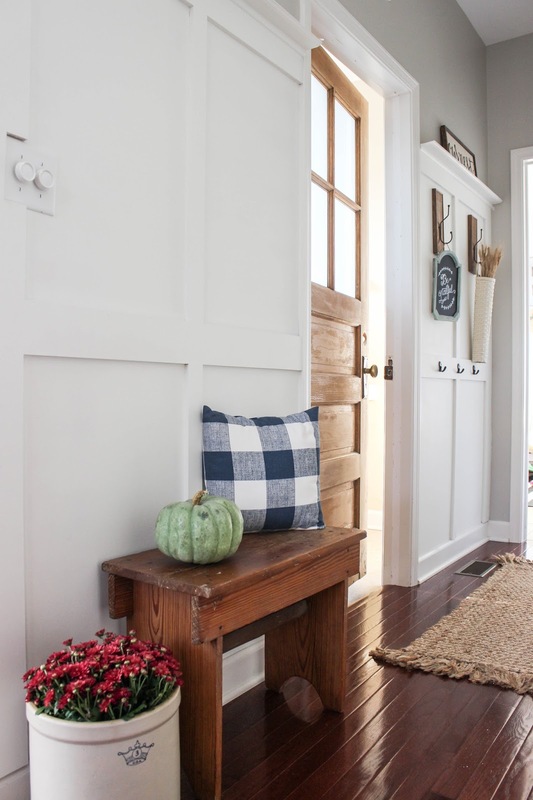 This little hallway is off to the side of our kitchen and I always love changing it out for the different seasons. I have no idea if mums can survive indoors but this year I'm obsessed with them. I just want to use them every where! I'm particularly fond of the red velvet colored mums mixed with the green pumpkin. It may just be my new favorite fall color combo! The little hanging "Be Grateful" chalkboard sign was an old DIY I did using this super simple hand chalkboard lettering trick. And then of course, this long hanging Goodwill basket was screaming to be adorned with wheat stalks. Well I hope you enjoyed my mini fall tour! A source list can be viewed below but the fun certainly doesn't have to end here though, make sure to hop on over to my friend's homes. I promise you won't be disappointed! Happy Fall! *Anything not listed has most likely been thrifted or handed down to me. Jennifer your home looks lovely!!! You're really making me want white walls!!! Happy Fall! Beautiful Jennifer! 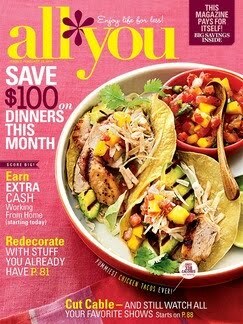 Love all your festive touches and the shelves turned out perfectly! Happy Fall! 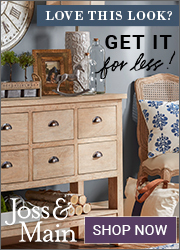 Absolutely love the touches of blue!!!! So amazing Jennifer!!! Happy Fall my sweet friend!! So pretty, Jennifer! 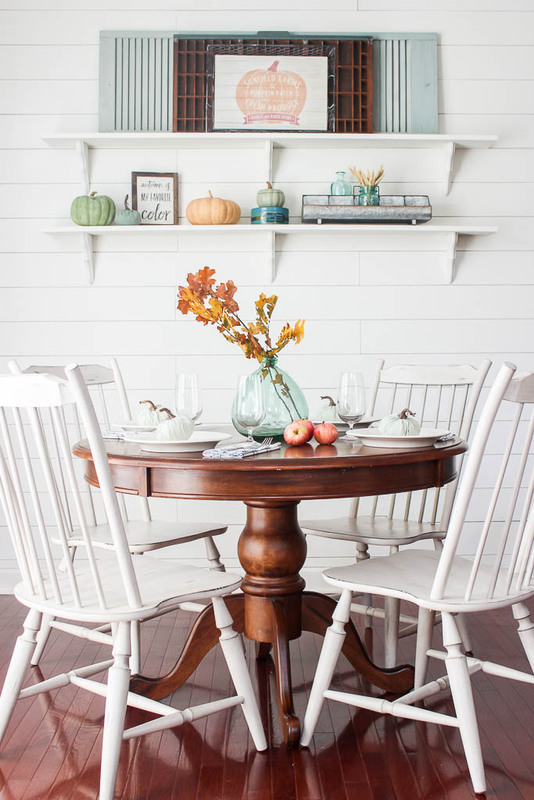 I love the soft fall touches in your home! 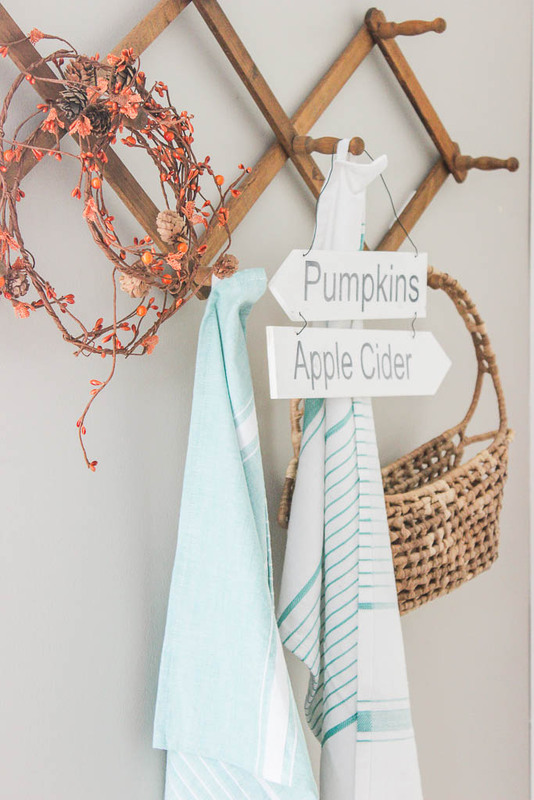 Love the beautiful way you added fall into your home! 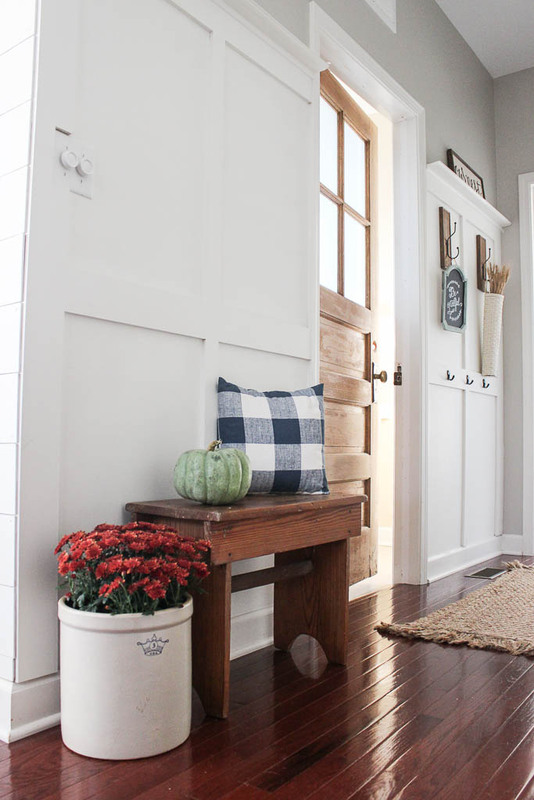 I love the entryway, what a great way to greet everyone. Absolutely beautiful! 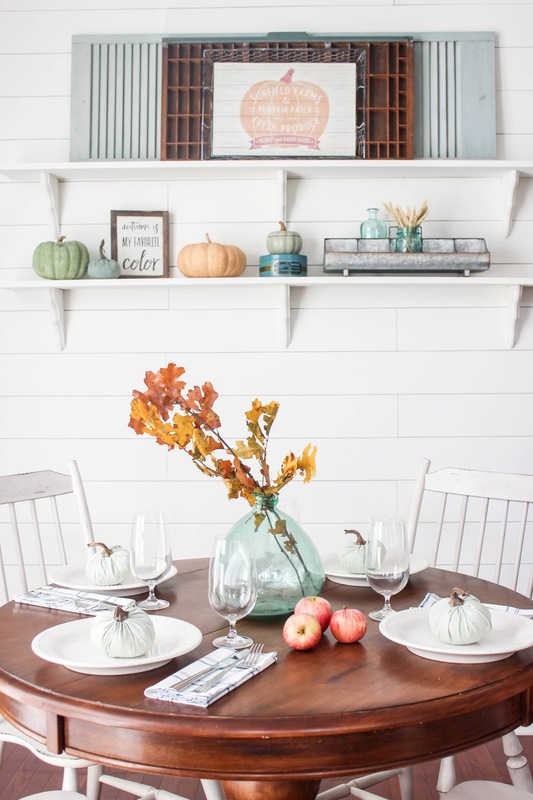 I love that shiplap wall and your new shelves all styled for Fall!